STARS is GB Productions' theater arts program for mentally challenged individuals. Started in 2005, we now have four separate groups meeting each week to learn and practice acting, directing and other theater skills. We have produced numerous shows with each group of actors. The shows have been very well received. 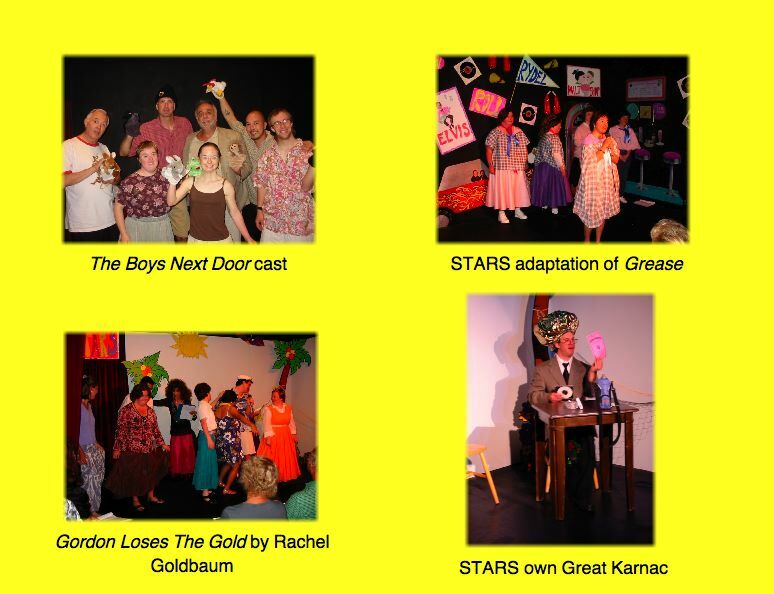 STARS actors have also appeared in other GB Productions shows such as The Boys Next Door, The North Park Vaudeville Show, and plays in the annual North Park Playwright Festival. Proceeds from STARS shows go to support the program. The STARS Theater Arts program puts an emphasis on developing abilities in stage presence, audition monologues, comedy improvisation, reading and memorizing scripts, costuming, and, most important, working as a team to support fellow actors on stage. "Tom Griffin’s The Boys Next Door, directed by Summer Golden, is set in a communal residence in New England. Jack, an increasingly "burning out" young social worker supervises the four mentally challenged men sharing the residence........What is strikingly different about this production is that several members of the cast, in fact, fit the description and are members of STARS, a performing troupe of mentally challenged actors.......The Boys Next Door is a popular play, but seldom seen in San Diego. Director Golden, who has directed the STARS group several times, as well as being an acting teacher, may be the first to combine stage actors with the mentally impaired. The show works on many levels. There is a dynamic with the actors as each helps the other in their parts. I am sure that the STARS group inspired the other actors even as they learned from them........This is an interesting experience, a wonderful experiment in combining the love of theatre with the love of helping others."